My oldest son is a chocoholic. I don’t fault him for this. He comes by it naturally. It’s handed down from generations of chocoholics… my grandfather, my mom, me… to name just a few. In a mixing bowl, combine beaten eggs, sugar, melted chocolate, cooking oil, baking powder and vanilla. Gradually add flour to chocolate mixture, stirring till thoroughly combined. Cover and chill for 1 to 2 hours or till easy to handle. Shape dough into 1 inch balls. *(see kitchen tip 1) Roll balls in powdered sugar to coat generously. Place 1 inch apart on ungreased cookie sheet *(see kitchen tip 2). Bake in a 375 degree oven for 8 – 10 minutes or until edges are set and tops are crackled. Cool cookies on wire rack. Makes about 48. * kitchen tip 1: Ever wonder how bakeries make such uniformly round cookies? I use a cookie scoop to form the dough into nice, round, even balls. They make cookie scoops in 3 different sizes (small, medium & large). You can find them in most kitchen specialty stores; Sur La Table, William Sonoma, etc, or online. I have one of each size and use them all regularly. For this recipe, I use the small one. 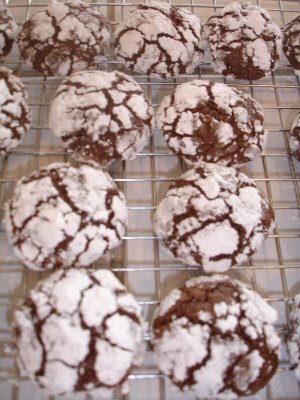 * kitchen tip 2: When baking cookies I always use aluminum jelly roll pans lined with parchment paper. It cooks the cookies evenly, allows for baking larger batches than ordinary cookie sheets, and clean up is a snap!